Cape Town’s once vibrant stamping ground for Spanish dance has, since La Rosa Spanish Dance Company’s demise, seen far too few renverses (turns) and zapateado. Therefore, news that respected guitarist James Grace and Sasolburg’s Carli Olivier’s Spanish Dance Productions were joining forces with Ilse Moore’s exciting underwater photography sent enthusiasts flocking to Theatre on the Bay. 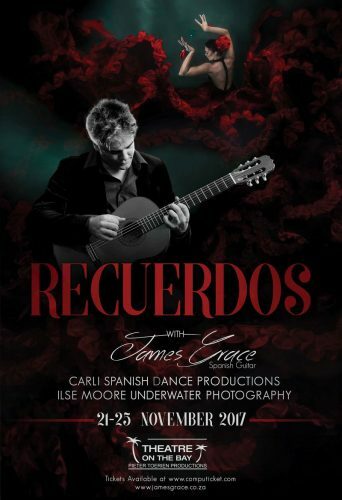 Recuerdos (memories) intended refreshing memories of past flamenco productions. Boasting superb water features, an occasional video clip showing these would link Recuerdos’s title, music, dance and water into a unified whole. Grace’s finger style is brilliant. As they raced over guitar strings they drew as much admiration as Olivier’s Danza Estilizada (stylized Spanish dance), and Moore’s remarkable slow-motion underwater pictures. Guitar, not public speaking, is Grace’s forte. Had a director overseen proceedings, he’d have guided Grace to memorise a prepared script rather than ad lib. A director would also ensure an efficient sound system. A different technique for Grace, who in Tango showcased he’s mastering this practice. His response to Olivier’s “red cordoba” teasing generated a sense of the sensuality essential to Spanish dance. Led by Olivier, her well-rehearsed, elegant company comprised Janca Erasmus, Monique Els, Marilie Viljoen and Georgina Jacobs. Olivier’s artistic choreography introduced typical palmas (hand clapping), pitos (finger snapping), occasional cante (singing), zapateado (beats) varied filigrana or floreos (hand movements). Undulating arms closely resemble classical ballet port de bras. Except, the elbow controls direction and arms rarely go behind the head. When holding coloured fans, dancers wove artistic shapes through space. And the swirling skirts of a basic slim-fitting black lace dress added to Olivier’s choreography, as did beautiful picos (long fringed) shawls, coats, and flower or peinta headdresses. In Farruca, while feet, in steel-tipped shoes zapped out zapateado, hand-held full-length black, gold-trimmed, chiffon coats wafted into unusual designs. Farruca and Serenata Espanola (Joaquin Malats) were Recuerdos’s most impressive dances. To Moore should go a top Ocean Art Underwater Video award. Particularly striking was her colourful Capricho Arabe visuals. As barefoot dancers stretched out a leg or lifted an arm, fabric swaths floated though water as mushroom-like bubbles floated to the surface. A stunning visual experience as strikingly beautiful as exotic tropical fish. Recuerdos, a many faceted show, is worth developing and taking to audiences further afield.